Massachusetts real estate agent shares his expertise and tips for choosing the best real estate offer when selling a house or property. All the hard work you put into selling your home will hopefully yield you some great offers – maybe even one that you can't pass up. For most sellers though, the process is more drawn out than immediate. You will get a number of offers on your property and will necessarily have to choose between them. This can be a tough call at times, requiring a real stark examination of what is most important to you and what you can ultimately accept. This is why it can be helpful to know how to choose the best offer – that is, the best offer for you. One of the things consumers will ask their Realtor, especially in a multiple offer situation is how to determine what is the best offer. My name is Bill Gassett, a Bellingham Massachusetts Real Estate agent and I am here to share with our readers my expertise on the topic. I have been selling real estate for close to thirty years and have learned a thing or two about reviewing offers. 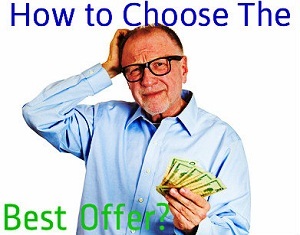 Here are my insight on how to choose the best offer when selling a home. Get clear on how offers work - Before you ever get your first offer, you should have a clear understanding of how this whole thing works. Read up on it and talk to your agent about the offer and negotiation process beforehand so you can approach all offers with a clear head and a plan. You should understand that any and all offers are up for negotiation. This is just how it works. You don't have to accept an offer if you don't like it. You can always ask that the terms of the deal be changed to suit your preferences. Look at the legal documents - Make sure you look at the actual offer contract you will be signing. Get to know the legal aspects of the contract including important things like the amount of escrow being held, the amount of money the buyer will be mortgaging, the closing date and any other inserted contingencies. Understanding the legalities of what you are signing is crucial. Understand your priorities – It is always helpful in any negotiation process to begin with a set of standards – things that you consider most important, that you want to get out of the deal. This is true when you are haggling at a flea market and it is true when you are negotiating your home sale. There are certain things that are more important to you. If you want a certain price no matter what – a risky approach but sometimes successful – you may need to wait it out through a number of offers. If you want to sell as soon as possible, you really may want to grab whatever offer comes in first. Take some time to get clear on what it is you want out of the deal, understand what you may have to give to get it, and negotiate accordingly. Have a plan – Your agent probably has a process that he or she prefers to use when taking offers on a house. Understand what this plan is from the beginning and make certain you are OK with it. An agent is usually flexible, within reason, and will want you to be as happy as you can be while the work is being done. He or she will advise you on a time frame for when to take offers and will discuss with you how you will analyze those offers. Your Realtor should know ahead of time what your personal priorities are concerning the sale of the home and he or she should explain what it will take to achieve those goals. For example if you need an extended closing the real estate agent should not that going in before an offer ever gets placed on your property. Scrutinize every offer – Your house is showing, you are getting interest, and then it happens – you get your first offer. You will be tempted to grab onto it, to accept it, just to be finished with all of the work and the waiting. Slow down. Realize that if things go well, you will be getting plenty more of these offers if your home is priced competitively for the current market. The last thing you want is to look up in a few months are realize you totally botched the deal and wound up with far less than you really wanted. Remember your priorities and your plan. Offers can be quite complex. There may be requests for changes to the home, they may ask for you to throw in things – your new barbecue grill, for instance – that are unexpected and need mulling over. The offer may include a substantial amount of earnest money – meaning it is harder for them to walk away – or no earnest money at all. It may ask that you cover closing costs, or that you follow a time line that is drastically different than what you were hoping for. Remember, all of these are negotiable. You don't have to accept any of them if you don't want to. There is the possibility you could be given a low ball real estate offer. Just don't get offended – it is best in negotiations to never take things personally. Look at each part of the deal and decide if you are willing to accept it and understand what you are getting out of the deal. Every deal requires give and take – just make sure you are getting enough for what you are giving up. Never let emotions get in the way of making sound business decisions. If your home has been on the market for an extended period of time the possibility exists that what you think is a low ball offer might in fact be the actual market value or close to it. Keep in mind that one of the top five home seller mistakes is pricing a home too high. As a seller you receive absolutely no benefit when you overprice your property. The common thinking among many homeowners is that if I price my home higher it will sell for more money. While this thinking of the surface is logical, it does not hold true. Homes that are overpriced languish on the market and end up being reduced over and over again until they hit the right number. By this time buyers are asking themselves what's wrong with this home? They look at the days on the market and end up offering you less than what the home should have sold for if priced correctly from day one. Getting a good offer on your home is an exciting proposition. You can see the light at the end of the tunnel for reaching your goals. Just go in being prepared for what awaits you. Stress in real estate transactions often comes from not being prepared. With this advice in hand you should be well armed when an offer comes in on your property.